Home / Engagement rings: Custom Design / Three Stone Rings / “Irina” Round brilliant cut diamond trilogy ring. “Irina” Round brilliant cut diamond trilogy ring. 3 stone diamond trilogy ring set with 4 x square claws in curved “V” settings. 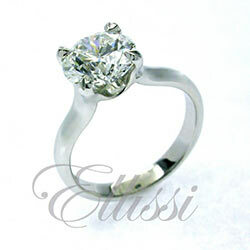 The design features a central diamond that is 0.62 ct F/SI1, with 2 x 0.24 – 0.25 ct matching side diamonds. The curve of the inner setting means that the view of the central diamond is not obscured by the settings. This ring has a square cross section band that is around 3.8 mm wide in polished 18 ct white gold.